Google makes it possible for third-party developers to integrate with its services like Chrome and Gmail, but The Wall Street Journal set off a firestorm after reporting that Google has been allowing third-party companies to scrape keywords and data in emails from Gmail. Apparently Gmail is one in a list of Google apps that share data with third-party developers. Stripe software engineer Robert Heaton recently found that Google Chrome and Mozilla Firefox internet browsers share online browsing history with third-party developers. 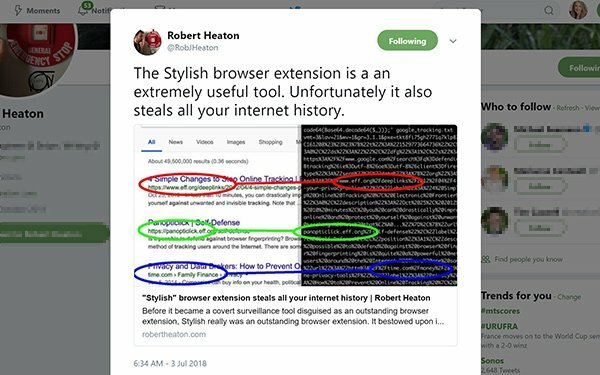 Heaton points to Stylish, an internet browser plug-in, that he found has recorded every website that its 2 million users visit, and has done so since January 2017. Firefox began doing the same in March 2018. The Stylish app sends the user’s complete browsing history back to its servers, together with a unique identifier, where its parent company SimilarWeb, a service to measure website traffic and related mobile app data, can tie in other pieces of data. Heaton suggests that SimilarWeb, through Stylish, now owns a copy of each user’s complete browsing history and enough other data to tie search and browser histories to email addresses and real-world identities. Search Insider reached out to SimilarWeb, but did not receive a response. Heaton writes that he has also seen sensitive URLs serve up. His online medical provider shows him his medical documents using secret, 1000-character-long URLs generated by Amazon S3 that expire within a minute or so. These pages do not require login authentication beyond simply knowing the URL, and anyone who guessed the authentication token in the URL before it expired would be able to view and download his medical documents. "In my opinion this is not best practice on the part of my online medical provider’s engineering team," he wrote. "But the real world is full of things that are not best practice, and no conventional attacker is actually going to be able to guess a 1000-character long URL within a minute."